Here’s how to keep track of your little garden seedlings – paint the rim of your clay seedling pots with chalk board paint and write the name of each plant on the label area after planting your seeds. Once your small plants are re-potted, or growing in the garden, just wash the pots gently, dry, and store for next batch of plants or next year’s sowing season. Prepare your clay pot for painting by soaking the pot in very hot water for about 10 minutes. This will help to clean it and remove any debris. Set the pot aside to dry completely. Once the pot is dry, paint the upper rim of the clay pot with chalkboard paint. You will probably need to paint at least two coats, but be sure to wait for each coat of paint to dry before applying the next.Do not use your pot for soil until it is completely dry. I recommend that you wait at least 10 days after painting before you plant. I plant seedlings every year and didn’t always know what seeds were in what pot, but this little craft helps me keep track of my small seedlings. 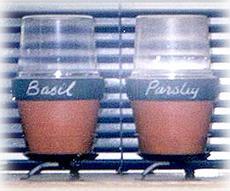 All you need do is write the name of the seeds or seedling on the rim and you’ll never wonder what plant is growing in that pot again.